I am participating in the Down Cellar Studio KAL aka the Pigskin Party 2016 which runs along the NFL season. In September you could win bonus points for projects that you could justify using in relation to football. I chose an earbud pouch so I could have my earbuds close at hand to listen to the games when I am out and about. I got the idea from Dani of the Prairie Girls Knit and Spin podcast because she made these for her kids backpacks/back to school. 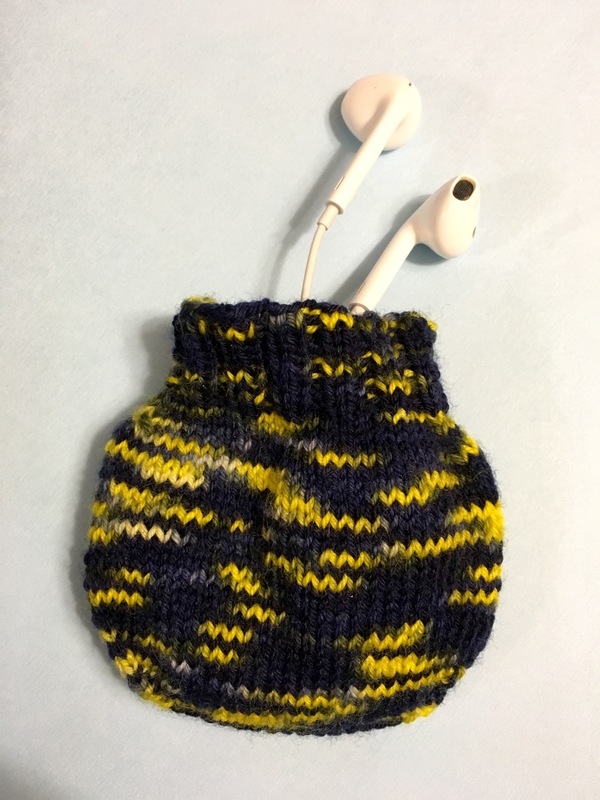 I started with the same pattern Ear Bud Pouch by Mary Keenan and then translated it to sock yarn and bottom up. My mods are in my Ravelry notes. It turned out a little small but still serviceable. But I suppose that happens when you only use 28 yards of yarn. And I scored 57 points for the KAL! This has already been pressed into service and is living in my purse! I have been keeping a pretty rainbow on my bedside table. 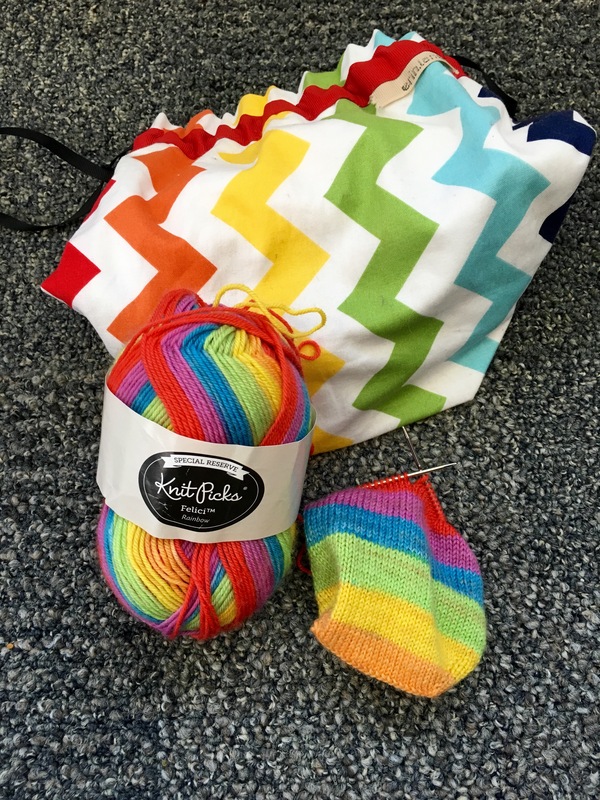 The Rainbow Bright vanilla socks have been my zen bedtime knitting. They only get a few rows here and there but I’ve managed to work through a complete set of stripes. And I’ve paired my rainbow sock bag with my rainbow socks. It makes my matchy matchy heart happy! I’ve finished the first sock and got a jump on the second one! I’m really trying to get the stripes to match and it’s working so far. Only two small fails, the first being that I wound my second small cake backwards so I have to work from the outside of the ball. 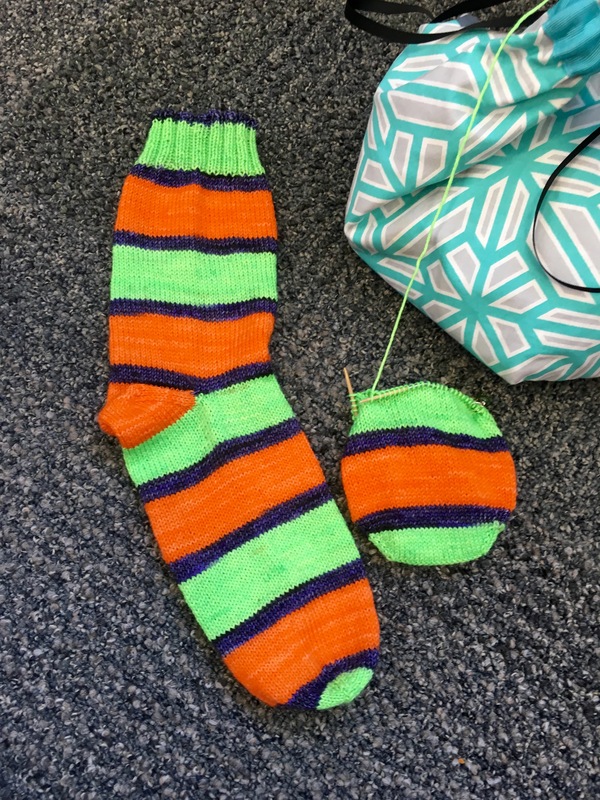 Secondly I’ve had to cut the green yarn in the toe to make the stripes match. It really only means I have a couple more ends to weave in. 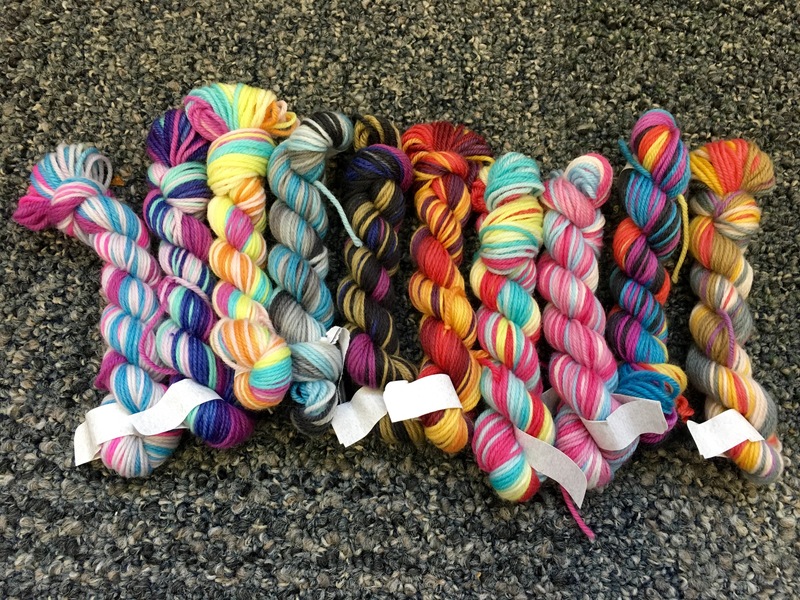 I’m definitely going to have a ton of yarn left from this generous skein from Berry Colorful Yarning. Just more yarn for scrap projects I guess! I’ve completed one tenth of my Mighty Rainbow Blanket! In other words I have used up the first color/skein of yarn. This yarn is just so soft and yummy. 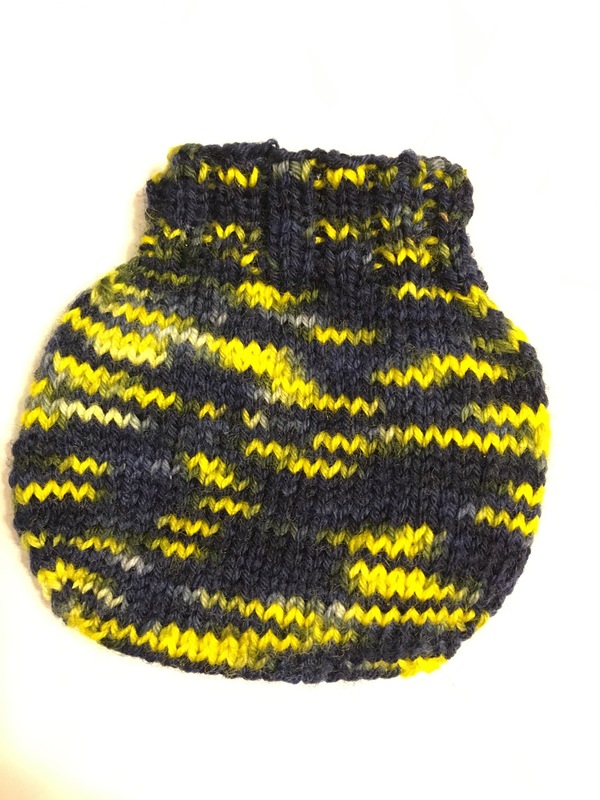 And the garter is just so soothing and perfect fall TV knitting. I’m done with red and started the orange. The pattern called for 30 rows per color but I was able to get 35 rows in red. I’ll see if I can get than any in orange! 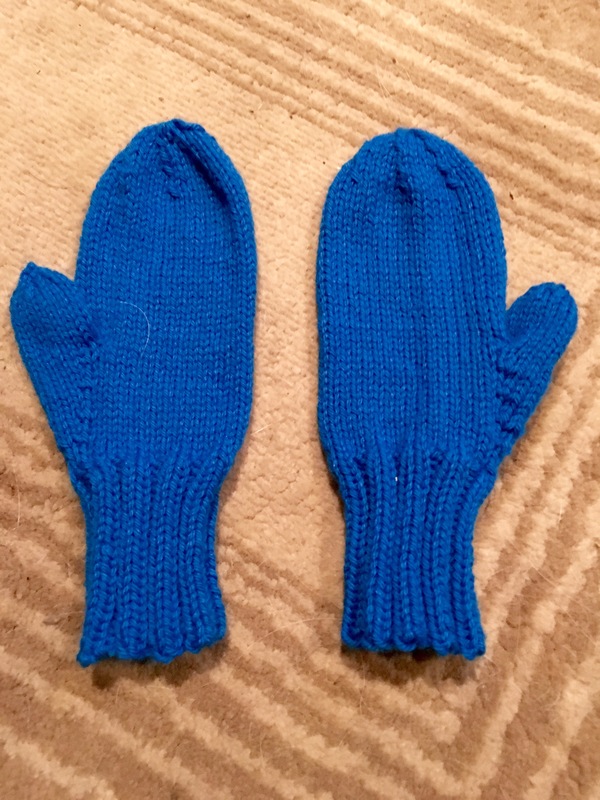 After finishing the first pair of mittens for Jellybean I immediately cast on for a second pair. I’m under no illusion that as a 2 year old he’s not going to make every attempt to lose or destroy these mittens. Backups are a must! I used about 100 yards of worsted weight for this pair and the last pair. They are very quick to work up as well. This project also served as #dcspigskinparty2016 KAL project. I worked this in my team colors (aka my dad’s high school football team) to earn extra points in the KAL. 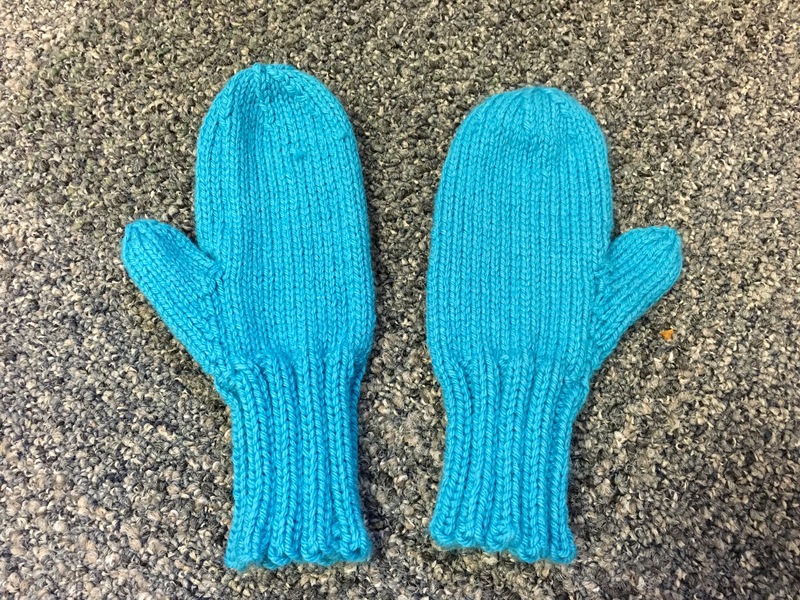 And of course Jellybean gets more mittens! These too need a good wash and block but are just waiting for winter to arrive! Happy Knitting!! 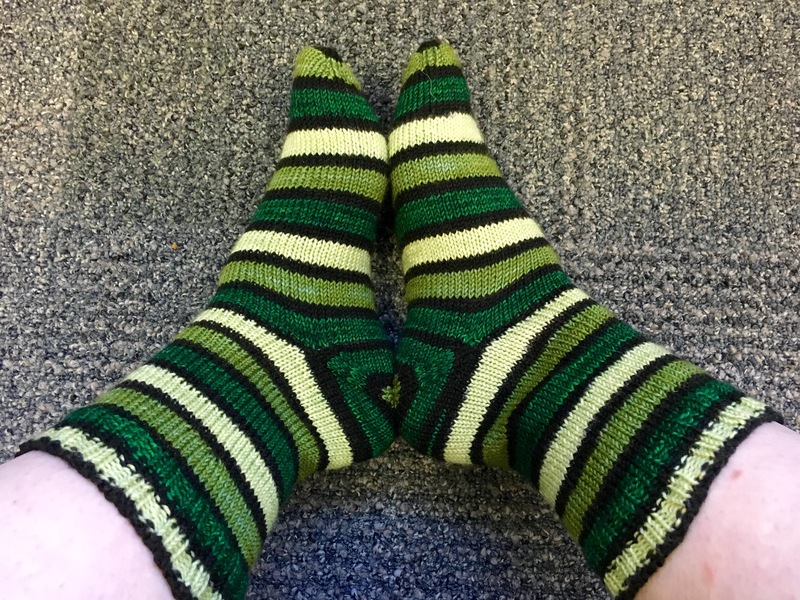 I recently found the Sock Yarn Swappers group on ravelry. I had just been a lurker and a stalker but I kept seeing all the swaps and swapless swaps going on and wanted to try one. So back in August I signed up for a Felici swapless swap for the new range of striping color ways that Knit Picks put out this fall. I got 20 minis of 20 yards to add to my Memory Scrap Blanket. This project is currently hibernating in Area 51. 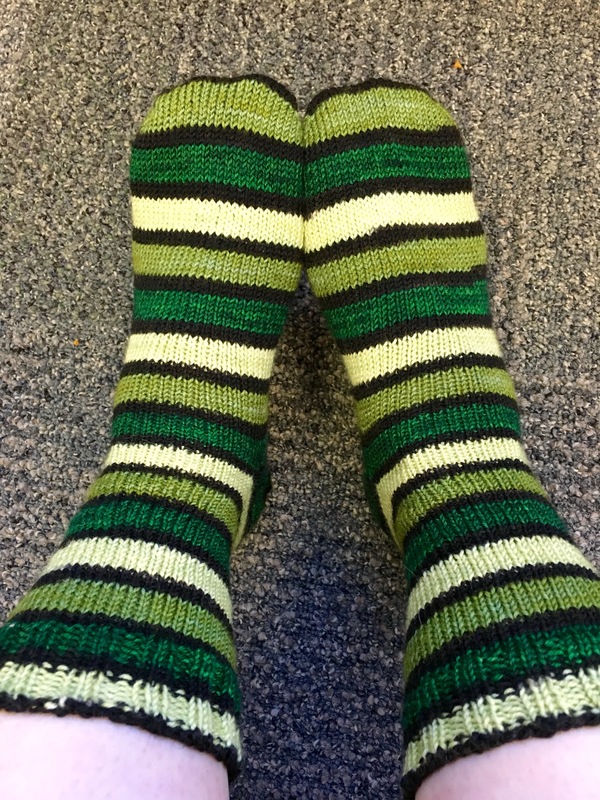 But I know I’ll love adding these self striping beauties to the mix when I pick it up again! I have the sock fever! 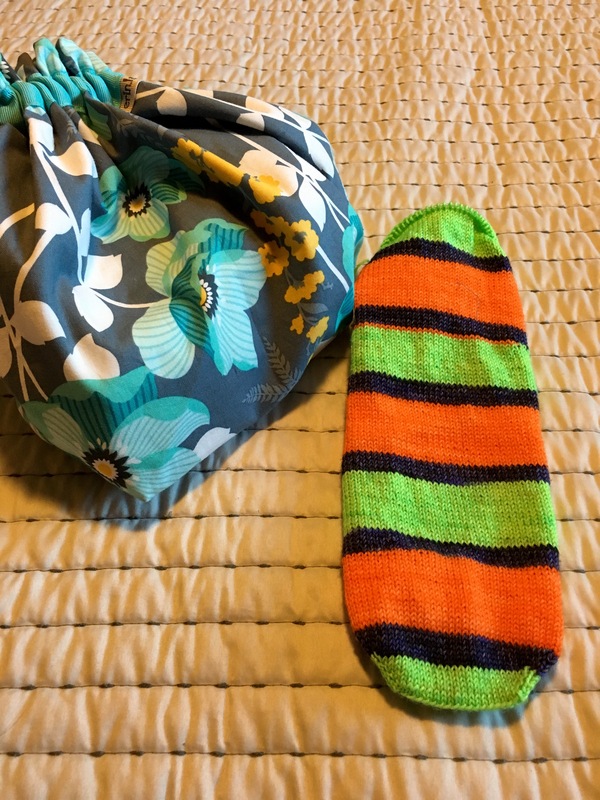 My newest knitting bag is housing my Spooky Vanilla socks and living in my purse. Shockingly if you work in a project it actually grows! I’m done with the foot, inserted the lifeline line for the afterthought heel (tiny orange stripe) and I’m moving up the leg. I’m already starting to eyeball the second ball of yarn to see if I can make them match! Two years ago today at 8:54 pm this happened…. Pardon me while I suspend my knitting today in order to snuggle a squirmy toddler and hide my momma tears from a two year old who is only concerned about his new toy tractor! I LOVE how great they match. This is really my first success at this pretty much ever. 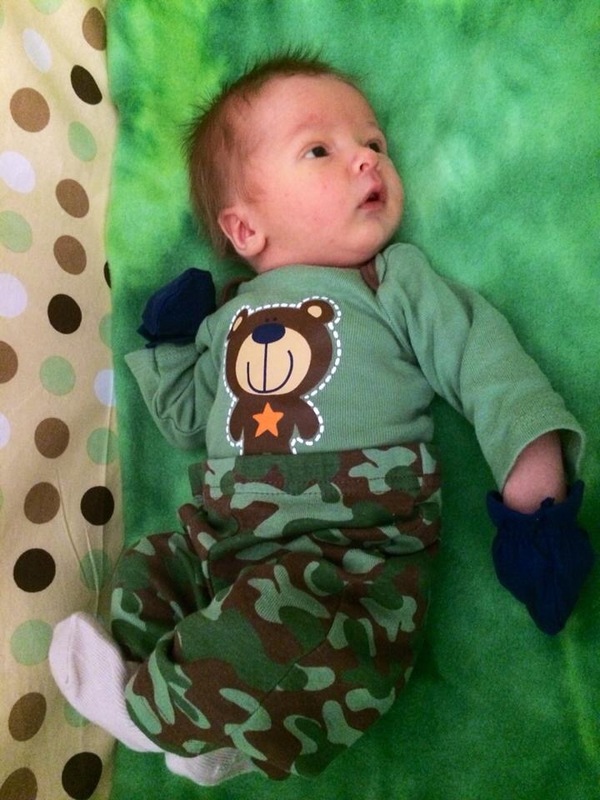 You guys….I knit these in FOUR DAYS over a long weekend that involved some grandparent time for Jellybean. 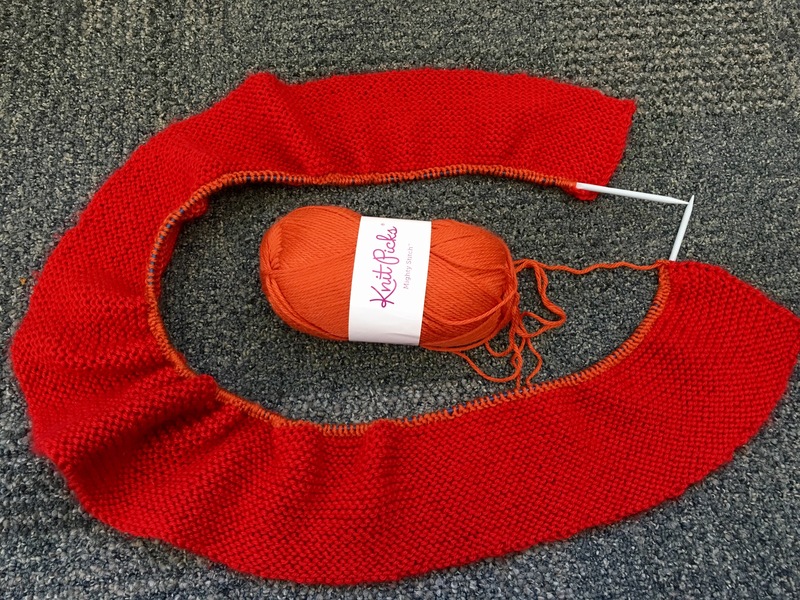 I want to knit this yarn all the time in all the colors….seriously! My husband better hide my debit card.